The SM442 is a new compact design CCD Spectrometer for use with a PC. Based on SP's special optical bench design, it supports many different applications where spectral or color measurements are required, including high dynamic range applications. The SM442 can accept light directly through its built-in slit or via optical fiber. The durable aluminum housing that encloses the SM442 provides stable optical bench operation over a wide range of temperatures. 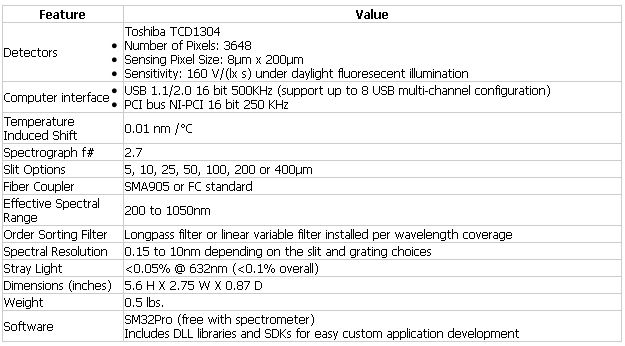 The standard sensor array used is the Toshiba TCD 1304. The array driver electronics have been designed for highly sensitive yet stable operation. This array (in conjunction with our special UV coating process and customized order sorting filters) allows up to a 850nm measurement window from 200nm to 1050nm (smaller measurement window sizes increase spectral resolution and light sensitivity). Thanks to increased pixel numbers from 2048 of old Sony CCD to 3648, the SM442 allows almost twice better resolution with narrower slit than the old SM242. Standard interface to the SM442 is a USB 1.1/2.0 compatible interface with 16-bit extended dynamic range. Our USB board can support multichannel configuration up to 8. With this multichannel configuration, a high resolution for wide range or a dual spectrometer system (one for measurement and the other for reference) is possible. 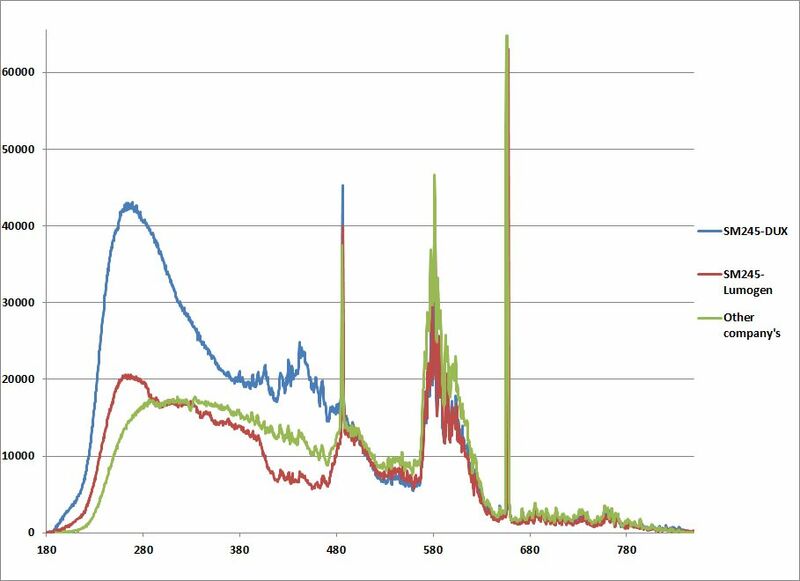 Spectral Products applies new UV enhancing coating on the CCD to increase the UV sensitivity below 450nm comparing with the conventional UV coating that is widely used in CCD spectrometers. By the help of this new UV coating, the signal sensitivity below 500nm can get improved ~20-50% more in general. The SM442 is a pre-configured model so if the desired wavelength range matches one of the standard wavelength ranges, SP can ship the unit within a couple of days. Software support includes a SDK and DLLs for dedicated applications development and our SM32Pro Windows-based spectral acquisition and analysis software.